Leaders from Middlesex University and London’s Capital City College Group (CCCG) are calling for barriers to lifelong learning to be removed, and for the education system to offer learners greater flexibility to move between different types of learning at different times in their lives. The calls came as Middlesex University and CCCG have entered into a new strategic partnership to plug the growing skills gap in London, and to create opportunities for students to participate in higher education by offering seamless learning pathways for people of all abilities, ages, and needs. 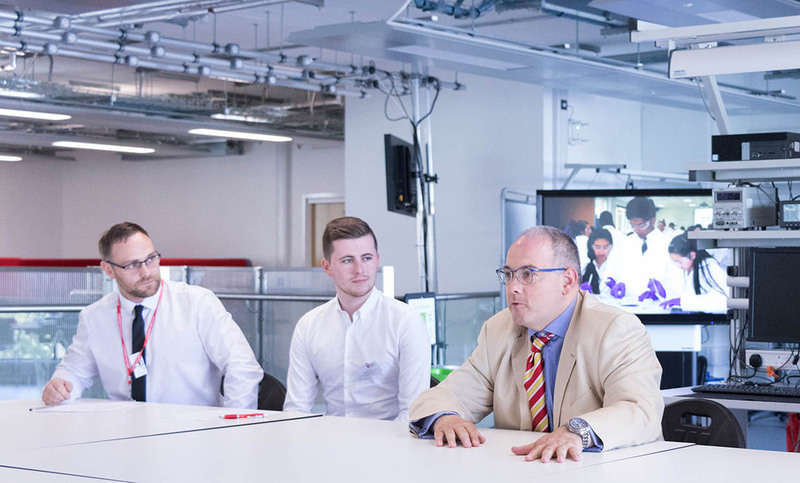 The partners hosted a visit from the Rt Hon Robert Halfon, MP for Harlow and Chair of the Education Select Committee, and Dr Matthew Offord, MP for Hendon, to see the partnership in action. “Currently, policymakers categorise the post-18 education system into academic and technical routes which suggests learners should choose one route or another – often at a young age- when in reality there is considerable overlap,” said Professor Tim Blackman, Vice-Chancellor of Middlesex University. “This does not reflect the reality of many people’s learning journeys nor the reality of the emerging jobs and skills landscape. Andy Wilson from CCCG emphasised the significance of the partnership with Middlesex. “Many of our students have overcome significant barriers to enter further education and we’re delighted to be able to work with the University to guide students through the various learning pathways on offer to be able to continue with their studies into higher education and fulfil their potential,” he said. “It is encouraging to see Middlesex University and Capital City College Group are collaborating to help learners navigate their learning journey, and creating ladders of opportunity for learners to support social justice,” said Robert Halfon. With the Government review of post-18 education and funding underway, Middlesex University London and CCCG believe a system of credits and levels – using a competency-based framework - would give the system the flexibility it desperately needs to respond to ever-changing skills needs, and to have a real impact on social mobility in the UK. The partnership also believes that apprenticeships are an essential, alternative learning pathway that could have a significant impact on social mobility. They are calling on the Institute for Apprenticeships (IFA) to collaborate more effectively with further and higher education to iron out issues over degree apprenticeship funding levels, approval of new standards, and retention of the degree qualification on completion of the apprenticeship. For more information about the crucial role HE and FE partnerships can play in driving social mobility and skills, please see Middlesex University’s recent submission to the House of Commons Education Select Committee Inquiry into the Fourth Industrial Revolution.